Yikes! However will I keep this gorgeous neat and tidy look without my Godmother Carol? Who does so much more for me than keep me beautiful on the outside? We’re on the hunt. Our good friends over at Rocky Creek Scotties put out the APB on Facebook hoping to find a local referral or two. Actually, truth be told, Godmother has been on the hunt since she decided to move. I’m thinking she’ll come through for Us. She wouldn’t leave me in the lurch. No. She. Wouldn’t. Now if she would just stay here. We walk to her house in the cooler weather. What could be better than that??? I’d better get used to not seeing her anymore. Sigh. 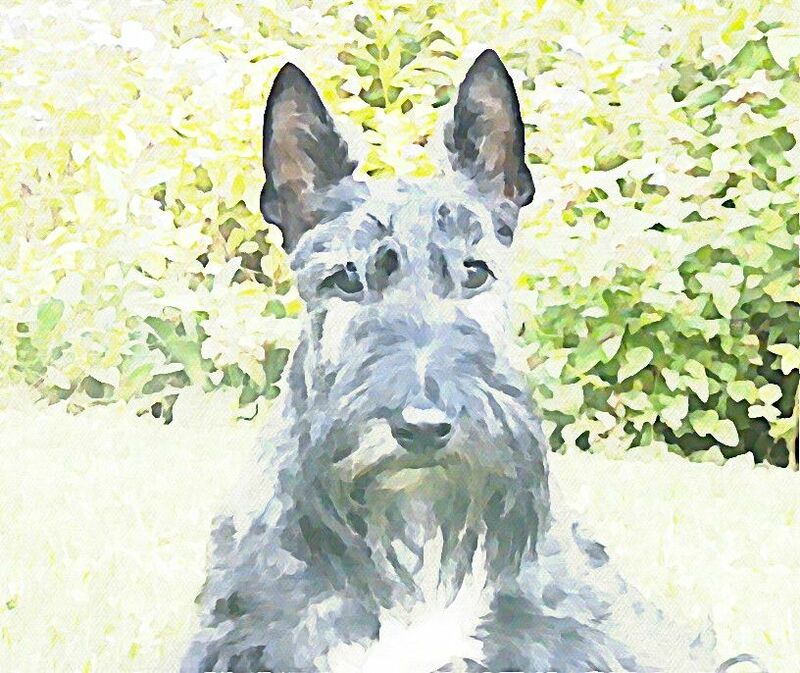 This entry was posted in The Scottie Chronicles and tagged dog groomers, dogs, friendship, love, Stuart the Scottie. Bookmark the permalink. 19 Responses to Watercolor Wednesday – Yikes! Oh Stu…you could always go au naturale like us!! Stuart, be patient. Give it some time, there is another groomer out there for you who is going to be just wonderful! We just know it! Finding a great or even good groomer of Scots is near to impossible here in Nati City, No one stripes fur ~ they want to make us look like poodles. Lee has taken to doing my furs. Can you tell I am getting the pan on the head cut special. But Lee says it is better than $60 for a poodle cut. You just might have to look like the rest of us Stuart. Yea Stuart, like Lee and Sweet William, my ma does my furs at home. There are no good folks like Godmother Carol where we live. Ma clips me, since she never could find someone who could strip me, or teach her how. I look just OK after my hair cuts, but at least Ma doesn’t give me a schnauzer clip, like one local groomer did when I was younger. I’m sure your beloved Godmother will find someone to help you before she moves. Still…. wish she wasn’t going ta go ta Michigan. Hang in there Stuart!! Time for your mom to learn how to groom you Stu. You wouldn’t bite your mom. you don’t need a haircut to be gorgeous……..it’s what is inside that counts. Godmother Carol will always be in your spirit. But we all agree this just plain stinks! OMD, just be glads Ma’s not grooming you!!! I NEVER knows what I’m gonna look like!!! Sometimes she leaves my leggies all long and furry cause I gets antsy after abouts 45 min. and she says she’ll finish later…does she..no! I walk around lookin’ like some 80’s reject!! and, we won;t even talk abouts the ear mangling of 2014…. Paws crossed for you Stuart! Finding a good terrierist groomer are tuff. My momma grooms me herself. oKAY sTUART!! Get your act together – you know the Godmother will not leave you in the lurch! muzzle, smuzzle – you have one great Mom Peep! I think you should just visit Godmother Carol whenever you need a trim! Michigan can’t be THAT far, right? Stu, we’re sorry about your predicament! It is very hard to find a good Scottie groomer! Good luck! Wish we could help you, but we live way out West in California, and the tuff part is Scotties aren’t as popular out West, we don’t think, because we don’t see many of them–very few, in fact. Dees Westerners are koo-koo! Don’t dey know how GR-r-r-r-eat Scotties are? Well, maybe I should tawdle out your way and we’ll all educate those Westerners about our Scottie ways! Please do, Stu! We’ll show dem!